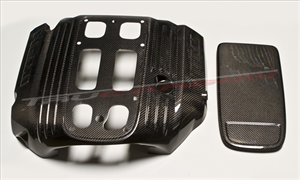 TruCarbon LG114 5.7L Hemi Carbon Fiber Engine Cover - TruCarbon TC010-LG114. FInally, a QUALITY 5.7L Hemi Carbon Fiber Engine Cover! Made from Grade AA Carbon Fiber, this TruCarbon 5.7L Hemi CF Engine Cover will set off any Hemi Powered Engine Bay!! Shipping: Ships by oversize freight. Please allow 48-72 hours to ship out. Shipping Remarks: Ships by oversize freight. Please allow 48-72 hours to ship out.